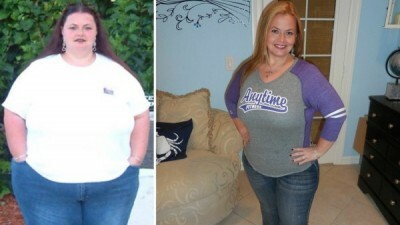 Dani used to weigh 363 pounds…that was 150 pounds ago! 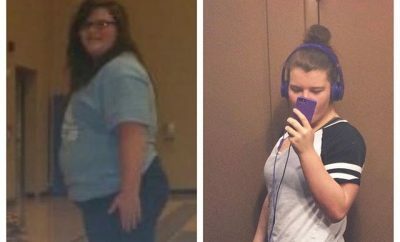 Danyeil Durrant was 10 years old when she first began dieting. She had no idea she would be wrestling with her eating habits for the next three decades. Wow, totally an amazing job! Proud of you every day. You rock Danyeil Durrant! It’s probably BC she’s outside in one or have a tan in the other. It’s her though I’ve been following her journey for a while. Are you only 5′ 2″? If so, you carry your weight very well! You look great! Awesome! Congratulations & God bless you for sharing your story! Im praying you reach ALL your hearts desired goals! great job! It is very hard to lose all that weight and to maintain it.So proud. Wow you look absolutely amazing! You are outstanding. How proud you must be! Congratulations on your fabulous weight loss!!! yes…..giving up fast food and soda !! I did a few years ago and have lost 45 pounds and kept it off !! No going back to either of those bad habits. Congrats Dani on getting healthier and happier !!!! My Hero! Now if I could just make myself get in the ball so I could be my own hero! Best weight loss story out there! Thank you for sharing your amazing journey!! You are an amazing lady!! Wow amazing way to go!! Yay Dani!!! You look amazing! Congratulations/Mazel Tov on your accomplishment. You are truly an inspiration to all. Aw that’s so nice! Thanks yall! Congrats Dani! I’m 58 years old but until now I can’t make through my dream ! I have trying all kind I’d my weight with all kind if things like going to zumba/ gym/hiring a trainer / watch DVD / bought all kind of weight lose protein stuff pill and more . Great job you look amazing !! Yay theres Danyeil Hamilton Durrant!!! Awesome job Dani!!!! High five to you!! Didn’t read the article, but I lost 50 lbs just by stopping the cokes and Dr Peppers and replacing with plain unsweetened tea. Took approx 6 months. That was about 3 yrs ago. You are amazing!! well done!!! Great job grl. I’m trying my self I know there’s a lot of ups an downs but you look amazing you were truly dedicated. Dani i need to talk to you only when you have time. I need help and i seen you have lost 150 pounds. The reason why i am asking you i have thyroid problems and diabetes and i have to lose weight bad. Can you please help me and thank you very much. And now she is a blondie! I love Get Down with Dani – Weightloss Journey!! Im struggling with weight loss myself. any suggestions on where to start? this is the most i have ever weighed and it just makes me more depressed and i feel like i can’t do it. i feel like why bothering trying when i know Im just going to fail anyway? ?